Then I'll share my story of the history, both ancient, cultural and agricultural, that binds them all together. Cross-pollinated plants (also called 'outcrossers') are those who prefer, and are sometimes physiologically required, to have their flowers fertilized by a plant other than themselves in order to maintain healthy genetic diversity and avoid inbreeding depression. 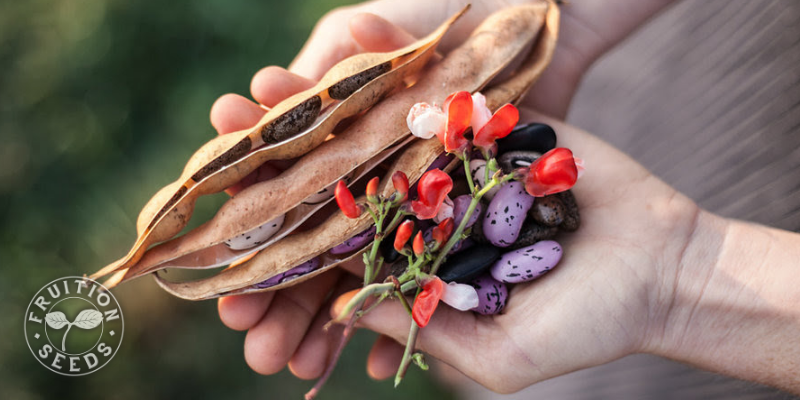 Beans, like these Chocolate Runners, are self-pollinated and exceptionally easy to grow. Self-pollinated plants (also known as 'selfers') have evolved to pollinate themselves while still maintaining genetic diversity and avoiding inbreeding depression. Advantage: Self-pollinated plants are much easier to save the seeds of, with confidence they haven't crossed. Disadvantage: Some selfers, like tomatillos, are self-incompatible so you'll need more than one plant to harvest fruit. 'Days to Maturity' (DTM) helps us know when to expect our harvest. The number refers to the days you'll most likely wait after a seed or transplant is planted in your garden until you are harvesting it. In the case of direct-sown lettuce, '52 days' refers to days you'll wait after sowing its seed in the soil. In the case of tomatoes and other plants that must be transplanted, DTM refers to the days you'll wait after transplanting that seedling into your garden, rather than when you started them indoors. There are many factors involved, from fertility to Zone to heat units to planting date. Choosing varieties produced by seed companies closer to you will give you a more accurate DTM than purchasing from companies in another bioregion. Disadvantage: There are just SO many variables, Friends! While DTM is invaluable, it just won't give you a precise prediction of harvest dates. Don't expect DTM to be totally accurate and you'll be a much happier gardener. 'Days to maturity' is found on every packet and is especially useful when planning for successive harvests. These terms refer to the growth habit of fruiting crops that may require trellising, most often tomatoes but sometimes peas, beans, cucumbers and others. I'll be describing them as tomatoes. Determinate varieties are more stout in stature, require less trellising and produce a heavy fruit set over a relatively short period of time. These plants sequentially grow all their leaves followed by their flowers, followed by their fruits, followed by their seeds. They tend to be more compact, so can be good choices for container gardens or when you have space limitations. Determinate varieties are also a great choice when you want to harvest lots of fruit all at once for freezing or canning! Pay special attention to the Days to Maturity (DTM) when choosing determinate varieties so you can spread out your harvest by planting some early, mid and late season types. Disadvantage: If phenomenal flavor is why you grow tomatoes, you'll have to try a lot of determinate tomato varieties before you find one. I recommend Seiger, myself. Determinate tomatoes are often selected more for growth habit than flavor, but Seiger is the best of both worlds. Indeterminate varieties tend to grow continually over the course of the season, making fruit continuously, producing leaves, flowers and fruit simultaneously. These plants tend to grow larger, developing longer vines that require some form of trellising support. Indeterminate tomatoes generally also benefit from some pruning. Many (though not all) heirloom tomato varieties are indeterminate. Advantage: If you want tomatoes that will continue producing all season, look no further. 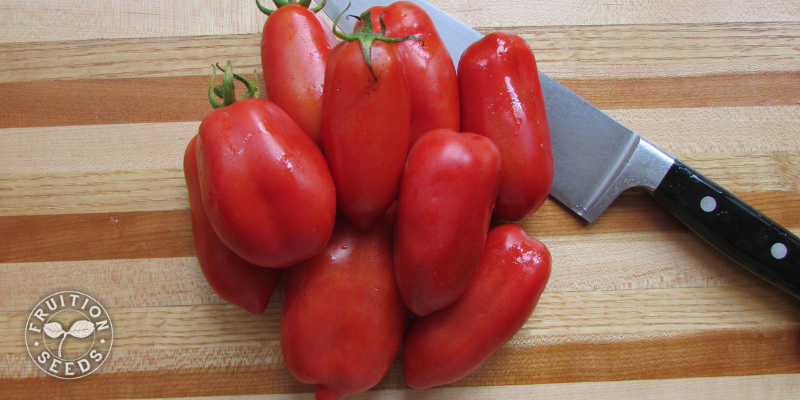 Disadvantage: If your season is super short or your garden super small, you may want to experiment with other types of tomatoes that will fruit earlier. Cherry tomatoes are the exception: Though indeterminate, they will produce a ton of fruit, early on til the end, if they have tons of disease resistance like Chiapas, Coyote and Summer's Sweetheart. Indeterminate tomates, like Brandywise, produce leaves, flowers and fruit throughout the season. Semi-Determinate varieties are indeed, not quite determinate and not quite indeterminate! In tomato lingo, which is mostly where you'll see this term, you can feel confident that variety will grow about 5' tall (a little taller than determinate tomatoes) and will have a longer flower/fruiting window. Advantage: Best of both worlds! Not to much to trellis, yet your fruit is spread out throughout the season. Disadvantage: Similar to determinate tomatoes, most of these varieties have been selected for growth habit rather than flavor. Try lots of varieties to see what suits you best! I recommend Seiger. Semi-determinate tomatoes, like Ten Fingers of Naples, are the best of both worlds, only growing about 5' yet continuing to blossom throughout the season. Dwarf varieties put impressively little energy into their leaves before flowering and ripening fruit. Craig Lehoullier's dwarf tomatoes are often less than 3' tall and leave nothing to desire for flavor. Advantage: If you grow in containers or have a small garden where every inch counts, dwarf tomatoes will surround you with abundance while not becoming an ocean unto themselves, as many tomatoes do. Plus, you don't have to prune them! Disadvantage: Again, dwarf tomatoes are generally selected for their growth habit and, in the case of Craig's dwarf tomatoes, great flavor. Disease resistance is often the limiting factor, so be sure you're setting your tomatoes up for success with our tips on preventing blight and other diseases in your tomatoes. Dwarf tomatoes, like Arctic Rose, are prolific, delicious and barely 3' tall, perfect for containers and small gardens. First things first: You won't unintentionally plant genetically modified (GM) seeds in your garden. I love how my friend Angie describes this: "Many seed companies expressly advertise that they are GMO-free, which is true, but much like advertising dairy-free apples or nut-free potatoes." Indeed, many different techniques (all requiring labs and genetic manipulations which would never happen in nature) constitute GM and to sow them you must first sign a stack of serious paperwork. The most common misconception I hear about GMOs is this: While it's true DNA is constantly transforming ('modifying') itself all the time, with or without humans, the 'modifications' performed to create a GMO would never happen in nature, with or without humans. Never. Disadvantage: Genetic diversity is considered a resource to exploit and patent. Monoculture of the mind, as Vandana Shiva so aptly voiced, is more deeply entrenched in our thinking than we'll ever know. For now, just one final notion: While it's true no seed company will sell a gardener a packet of GM seed, many large companies that sell non-GMO packets to gardeners own other companies that sell GMOs at scale to commodity growers. So when you're tempted to ask, "are these seeds GMO-free?" instead ask, "is this company owned by a larger company that sells GMO seeds?" While all companies can satisfy you on the former, you may be surprised how few can satisfy you on the latter. Technically, an 'heirloom' or 'heritage' variety is simply an open-pollinated variety that has been saved for more than fifty years. 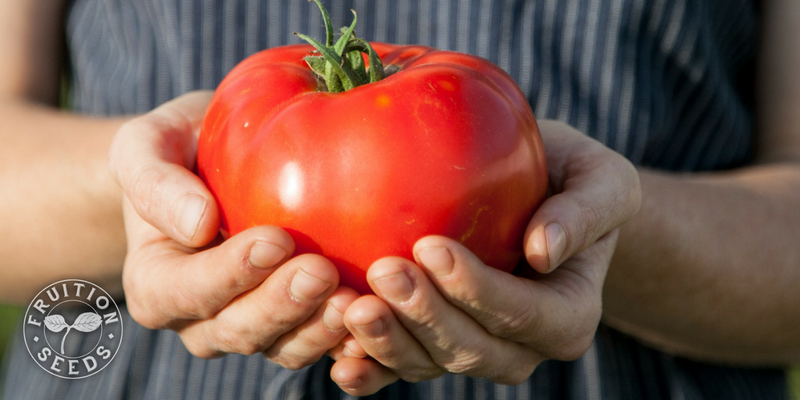 To broaden the term, heirloom varieties often have great cultural significance to particular people and particular place, sharing much more of a story than any fifty-year timespan. Disadvantage: As OPs, heirloom varieties require selection to maintain relatively uniform expression as well as genetic diversity. As seed has moved from a commons to a commodity, this selection work has been largely neglected for many decades. As a result, many heirlooms are not as productive or uniform as they could be. 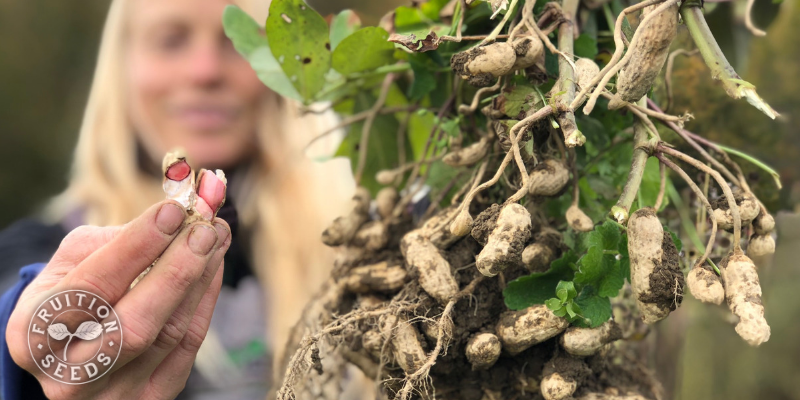 OPs like this Northern Hardy Valencia peanut are the best of both worlds: With rich history and great selection over the generations, they're abundant in so many more ways than simply yield. Note: Making an F1 Hybrid is simply the careful control of a perfectly natural process, without gene insertions or cross-species manipulations. F1 Hybrids are thus fundamentally different from GMOs. Advantage: If you need uniformity, F1 Hybrids have been developed for you. Increased yield, consistent harvest dates, disease resistance: F1 Hybrids are designed to dial in a specific trait that. Disadvantage: F1 Hybrids are often the result of patented parent lines, continuing the culture of patenting life while removing growers from access to the source of their seed. (This is not always the case, as the Long Story below shares.) Also, F1 Hybrid seed does not grow true to type, making growers even more dependent on seed as an input. 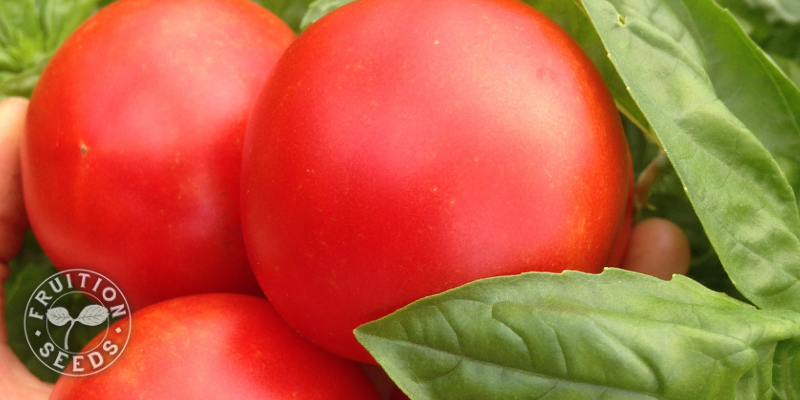 While most F1 Hybrids are made from patented, highly restricted parent lines, our Summer's Sweetheart tomato is not patented, pairing robust disease resistance with rich flavor. Landraces are the diverse genetics that tell the story of wild plants becoming domesticated. They express much more diversity than most varieties in seed catalogs, but are becoming more domesticated as humans select and save their seeds. They are often profoundly adapted to place, the deepest heirloom of heirlooms. Advantage: You will (almost) always have a harvest. No matter what flood or drought, pest insects or high winds may batter your crop, the genetic diversity inherent in a landrace will allow some plants to survive, even if some do not. They are immensely resilient. Disadvantage: Most of us have never heard of landraces because they cannot efficiently be harvested by machine. Landraces were thus left behind in heartbeat by industrialized agriculture in the last century and a half. 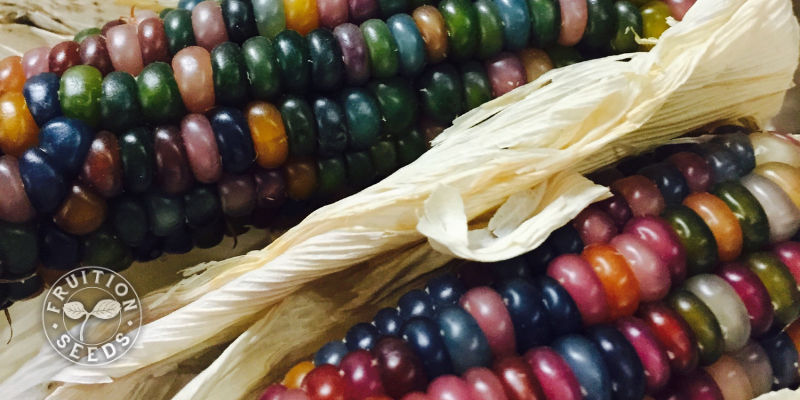 Though not a landrace, imagine the diversity of landrace varieties being expressed, in every way, like the diversity you see in the kernels of Glass Gem. There are no regulations around the terms 'natural' and 'all-natural,' so there consider them meaningless marketing jargon, because they are. Open-pollinated (OP) varieties are those whose seeds, when saved, grow 'true-to-type' and look very similar to their parent plants. Contrast OPs with F1 Hybrids, whose seeds do not grow 'true to type' and express much more diversity than their parent plants. OPs are increasingly becoming patented, as seed companies try to recoup the costs of developing and maintaining them. You'll see such patented OPs labeled as PVP (for Plant Variety Protection) and as even more protected UP (Utility Patents). How to respectfully develop and share OP varieties is one of the most challenging conversations in the seed world. 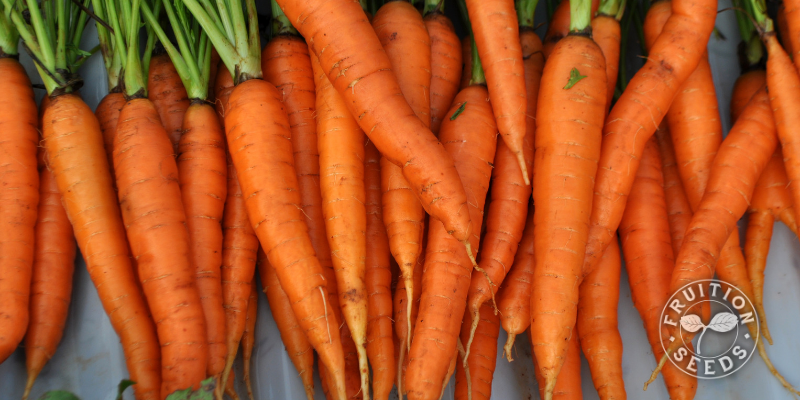 Organizations like OSSI (Open Seed Source Initiative) are spearheading novel approaches; Fruition is grateful to develop new OPs like our Dulcinea carrot and pledge them with OSSI to ensure it's genetics remain openly available for all generations to come. Advantage: OP seed can be saved (unless it's patented) and is easier to adapt to your garden and bioregion, as a result. Disadvantage: Since OPs are less profitable than F1 Hybrids, seed growers are not being paid to select them rigorously. As a result, they've become much less uniform and often less productive, making OPs less favorable than F1 Hybrids in our food system. Among other things, this encourages multinationals to control more and more of our food system and beyond. Certified organic seed is saved from certified organic plants. 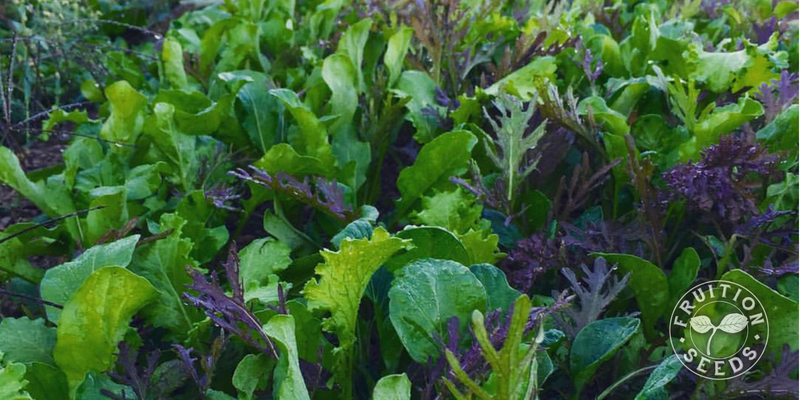 Advantage: If you want to grow a more abundant garden with less inputs (chemical/miracle gro fertilizer, herbicides, pesticides), organic seed will thrive in such conditions more than conventional seed. Disadvantage: Organic standards are becoming less stringent as the market increases for organic products and industrial interests control the supply. Which is just another reason to source your seeds from organic seed companies who focus on growing their own seed and sourcing from other small growers, like Fruition. You'll find more here. 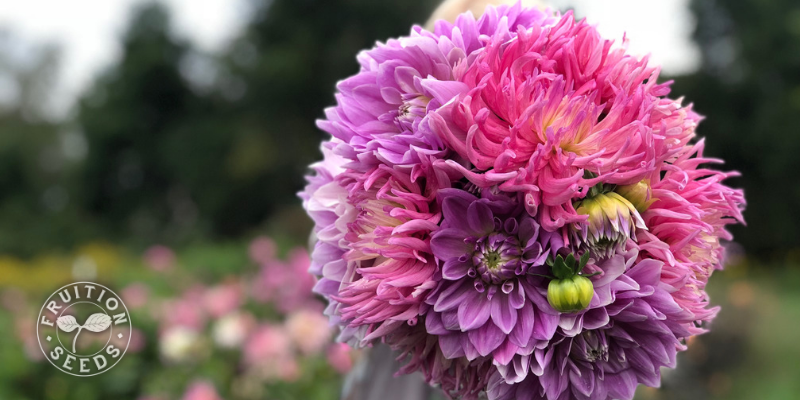 Organic seeds, even of flowers like these dahlia tubers, make organic gardening so much easier. Increasingly, many small seeds are being pelleted, or coated with quickly decomposing material that allows them to be picked up easier, whether by hand or by machine, to be sown at more even rates. Make sure you're getting certified organic pellets to ensure there are no fungicides, pesticides or other chemical additives. Advantages: Pelleted seeds are so much easier to sow at any even rate, especially by hand. Disadvantages: Pelleted seeds are much more costly than un-pelleted seed. 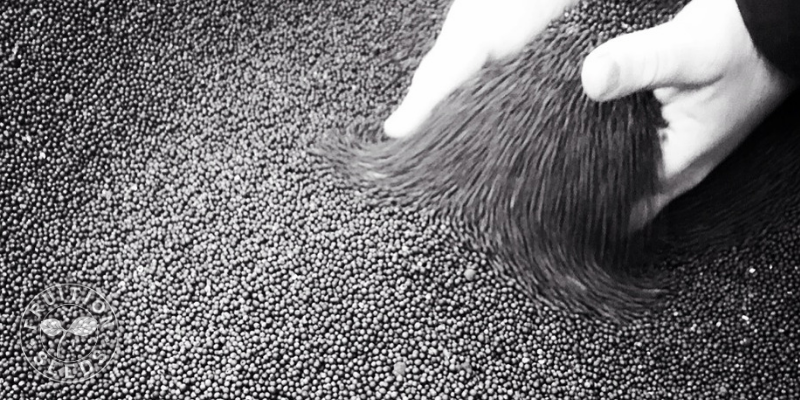 Treated Seeds have been coated with a chemical agent to help protect against common pathogens. Often a fungicide has been applied to help keep seeds and seedlings from rotting or damping off in cool, damp soil. Seeds may also have been treated with insecticides to kill off insects that tend to feed on seeds or young plants. Treated seeds are not suitable for certified organic use. Untreated seeds have not had any synthetic chemicals applied to them. Certified Organic growers are required to use untreated seed. Untreated seeds like this Red Russian kale are your best choice for organic gardening. Winter is the 'vernal' season (when you dig down to the roots of our Romantic language) and 'vernalization' is the time required for a seed to experience below-freezing temperatures, or winter, before it germinates. Most domesticated seeds require no vernalization. Some domesticated flowers, like echinacea, and many wild species very much require vernalization, like milkweed. 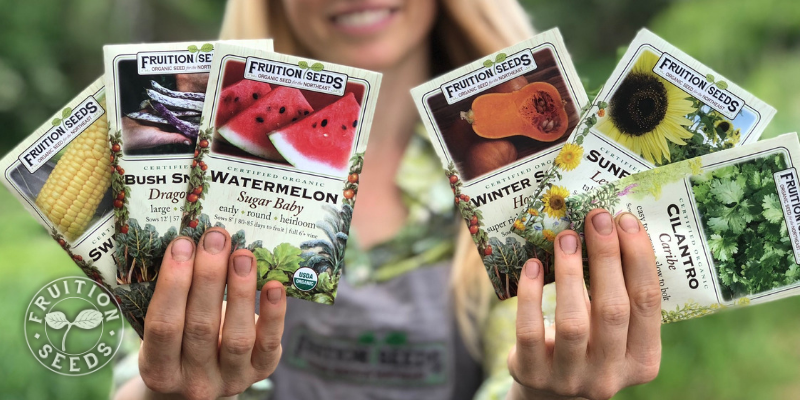 Fruition Seeds and many other seed companies will curate this vernalization for you, so you don't have to think twice, you can simply sow them. For 125 million years, plants have been flowering, pollinating and producing seeds. Some pollinate by crossing with themselves (self-pollination), some cross with others (cross-pollination) and some do both! Friends, plants are AMAZING. Now, this is the general story of pollination. 'Open-pollination' comes millions of years later. In fact, just ten thousand years ago, with the curious, enterprising human starting to save seed. Indeed, for the last 10,000 plus years, humans have been saving seeds (I suspect plants and people have been selecting each other, but that's another story...! ), creating genetic diversity that never existed prior. In effect, we were 'domesticating' plants just like we were 'domesticating' cows: We were taking wild populations, selecting certain individuals to save seed of that especially suited our tastes and slowly, generation after generation, made them less wild. Such populations of wild plants slowly becoming domesticated are known as a landrace. The intermediary between wild plants and domesticated varieties, landraces express slightly more uniform traits than their wild ancestors. The first time I saw a landrace, I instantly knew it. I had read about landraces, I'd heard about them, but growing up a white girl in the dairy-centric Finger Lakes of New York, I'd never seen a landrace growing in a garden or a field. That day in Guatemala, I knew the corn in this field was a landrace because there were stalks 4 feet high and 24 feet high. There were green stalks and red stalks, variegated green and red stalks. Stalks with 4 ears, stalks with no ears. THIS. This was diversity. This was resilience. The benefit of a landrace, among other things, is this: You will (almost) always have a harvest. No matter what flood or drought, pest insects or high winds may batter your crop, the genetic diversity inherent in a landrace will allow some plants to survive, even if some do not. They are immensely resilient. The principal drawback of a landrace, which is why most of us have never heard of them, is that they cannot efficiently be harvested by machine. Landraces were thus left behind in heartbeat by industrialized agriculture in the last century and a half. With horrific irony, companies like Monsanto today are isolating and lifting traits from their genomes to benefit their genetically modified monocultures. More on this to come. 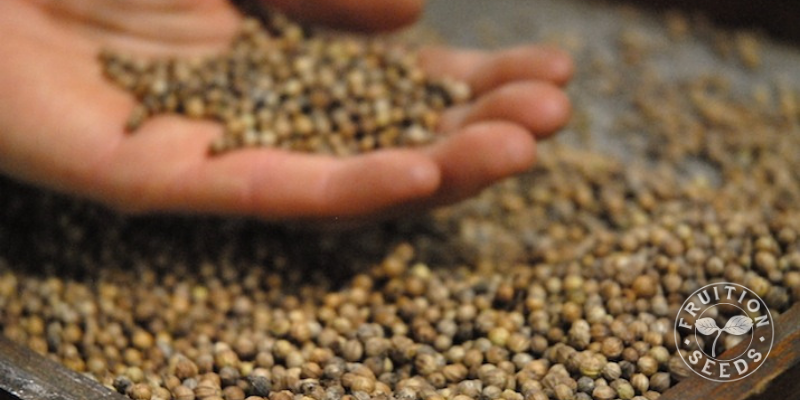 Once landraces have been selected for more uniformity, we call them 'open-pollinated' (OP) varieties. OPs still have lots of genetic diversity and the resulting resilience, but they've been selected to the extent that individual plants look much more similar to each other. Think of a new OP variety as a new book or an original song: Though it's influence has been countless millennia in becoming, it's nevertheless brand new to the world. Indeed, seed saving and plant breeding are forms of art. Once a new variety has been shared and its seeds saved for more than fifty years, it is technically an 'heirloom' variety. I have lots of other notions around heirlooms, believing cultural significance and relevance to place are important to their identities, and so much more. 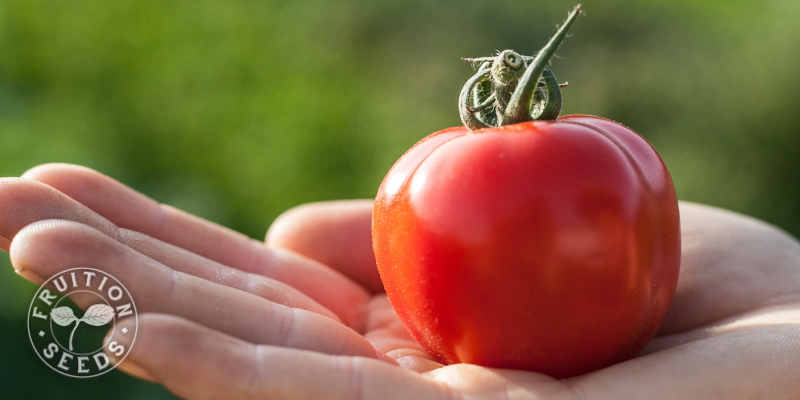 For the sake of brevity and clarity, know that most seed companies, when they claim a variety is an 'heirloom,' they are simply acknowledging a variety is open-pollinated and was introduced more than fifty years prior. Another important aspect of F1 Hybrids for me is this: the parent lines are often patented, considered intellectual property and thus highly proprietary. To me, owning another human is slavery, an unthinkable form of oppression. They don't have to be, but they mostly are. Also, that F1 generation has relatively little genetic diversity and is generally very uniform as it grows. They are often bred for traits such as earliness, yield, predictable days to maturity, color; in other words, they are largely a response to industrial agriculture wanting to streamline their supply chain for a commodity market. That being said, there are exceptions and Fruition Seeds offers two of them! 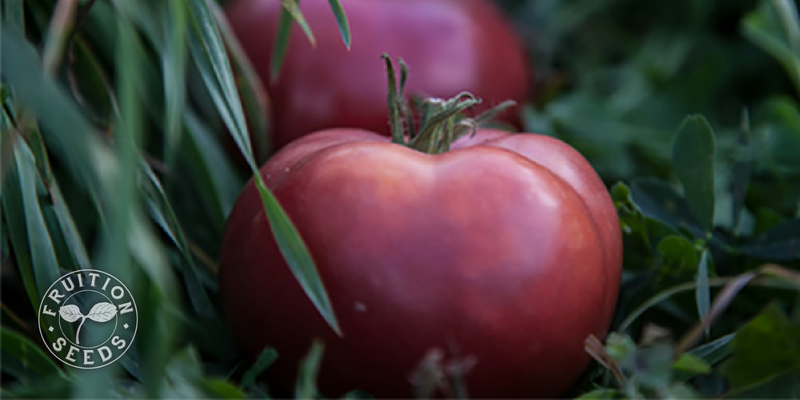 We have two tomatoes that are the F1 cross of a super disease-resistant parent and a super delicious tomato, so Brandywise and Summer's Sweetheart are truly the best of both worlds. Neither of the parent lines are patented: Their parents are fully disclosed and publicly available. We can and will make stable OPs out of them, and that may take another decade. In the meantime, you have incredible, non-proprietary F1s to surround you with delicious, disease-resistant tomatoes right now. Especially in our changing climate, I suspect such non-proprietary F1s will play a surprising role in the development of new, bioregional food systems. And Friends, note that 'hybridization' happens all the time, in fact with every cross-pollination in nature. An F1 Hybrid technically has an uppercase 'H' to designate it not as a phenomenon but as a noun. The dawn of GMOs came in the early 1980s, when the chemical companies who had freshly invested in their agricultural portfolios decided to make commodity crops (corn, soy, sugar beet) 'Round-Up Ready,' or able to be sprayed with Round-Up and not be killed, as a means of making such fields easily weed-free. And Friends, have no doubt: You won't unintentionally plant genetically modified (GM) seeds in your garden. 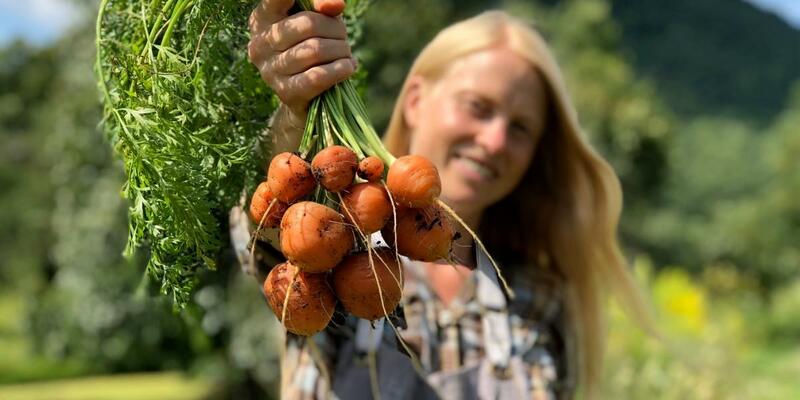 I love when my friend Angie describes, "Many seed companies expressly advertise that they are GMO-free, which is true, but much like advertising dairy-free apples or nut-free potatoes." Indeed, many different techniques (all requiring labs and genetic manipulations which would never happen in nature) constitute GM and to sow them you must first sign a stack of serious paperwork. To keep GM to a true nutshell, I have but one final notion: While it's true no seed company will sell a gardener a packet of GM seed, many large companies that sell non-GMO packets to gardeners own other companies that sell GMOs at scale to commodity growers. So when you're tempted to ask, "are these seeds GMO-free?" instead ask, "is this company owned by a larger company that sells GMO seeds?" While all companies can satisfy you on the former, you may be surprised how few can satisfy you on the latter. GMOs have the bad rap for patenting life, which they deserve. Increasingly, most F1 Hybrids and even OPs are able to be patented, as well. Never before in history has so much diversity been controlled by corporations with so little interest in expanding and sharing it. Friends, there is so, so much more to share. So joyfully pour through your catalogs, please! The seeds you sow and the companies they come from --- and thus YOU --- play a larger role in changing the world than we may ever know.